Looking to make precise seats for your pavé-style settings? Busch® has formed a convenient 12-piece set which includes all that is needed to do this setting. Set includes 6 (One Each) Busch® 1AU Carbide Burs (010, 012, 014, 016, 018, 023), 4 (One Each) Busch® 4205S Carbide Twist Drills (007, 008, 009, 010) and finally 2 (One Each) of the 231F and 231FL Circular Saws (0.2, 0.3 Diameter). Your first step will be to create precise holes in your metal surface using a Busch® pavé twist drill. Due to its short working part, the 4205S Twist Drills produce uniform holes in very narrow spaces as necessary for tight pave settings. Recommended speed: 3,000 - 5,000rpm. 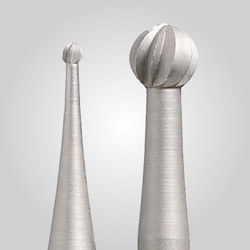 Numerous holes can be drilled with constant precision after centering as these drills are made of the finest carbide. The second step will be to round out the upper part of the seats with one of the 1AU round carbide burs. The carbide material will allow for longer life and consistency over standard steel burs thus producing a precise seat every time! Recommended speed: 2,000 - 10,000rpm. Set includes one each: 1.0mm, 1.2mm, 1.4mm, 1.6mm, 1.8mm and 2.3mm diameters. Finally, after completing steps one and two, it will be necessary to make a clean cross cut with a Busch® 231 F/FL Circular Saw. This will give you a clean and crisp space between the seats. 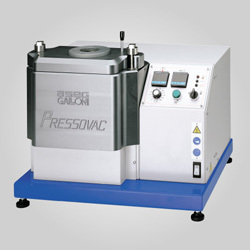 You can choose the desired saw thickness to cut the desired notches for the stones. Recommended speed: 7,500 - 30,000rpm. 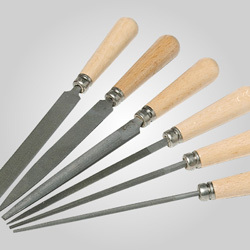 All contents of the set are mounted on 3/32" shanks and are made of long lasting carbide and thus will maintain their shape and sharpness for many uses! Items also available separately. Made in Germany.